Sonya Koshkina talks with "amber MP"
Boryslav Rosenblat denies NABU charges. Watch at 20 pm on Channel 24. The name of the people's deputy Boryslav Rosenblat (PPP) has been topping the news headlines for the third day in a row. The scandalous detention of his assistant on a 200 thousand dollar bribe, the involvement in illegal amber mining, and lobbying for a foreign company is only a part of the accusations of anti-graft agencies against the pro-presidential lawmaker. How the arrest unfolded and if the allegations of anti-corruption bodies are substantiated – learn from Boryslav Rosenblat firsthand on the talk show Left Bank with Sonya Koshkina. 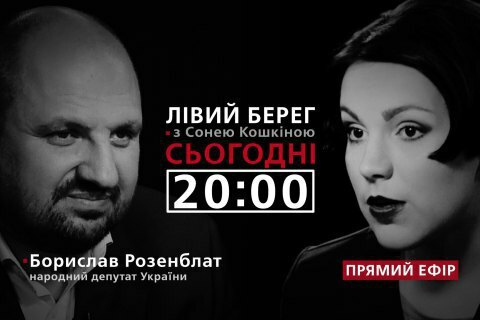 Today, 22 June, at 20:00 Kyiv time on Channel 24.